Find A 4-H Club Near You! Emerald Star Application (Word)What is an 4-H Emerald Star? Interested in pursuing a Santa Barbara County Emerald Star project? 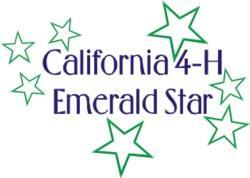 Many counties in California have an Emerald Star program, which is sponsored by the county 4-H office and/or the county 4-H leaders' council. The Emerald Star program is designed for intermediate and senior 4-H members. This program is designed to help youth learn about project planning, organization, and presentation. Typically, youth develop an action plan for some type of multi-county event. They then organize and facilitate this event. After completion and presentation of their project, they are awarded with the Emerald Star ranking.